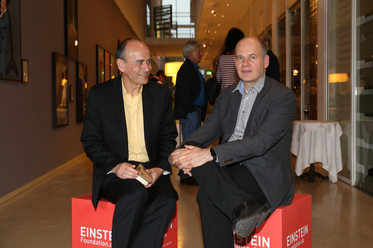 Einstein Foundation and Café Einstein jointly host talk with noble prize winner and Einstein BIH Visiting Fellow Thomas Südhof on September 16th at the prominent Café Einstein Unter den Linden. 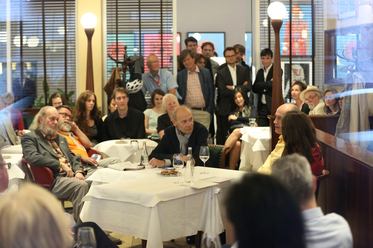 The talk kick-started a new event format “Einstein meets ...“ of the Einstein Foundation Berlin. A full salon in the afternoon. Expectations must be high when guests are even crowding in the hallway eager to catch a glimpse of a genius in neurosciences. Their expectations were more than fulfilled. 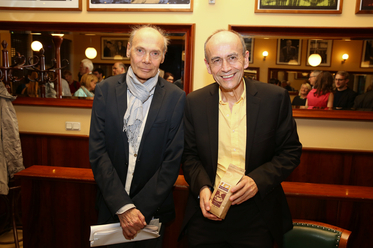 It was a great honour for the Einstein Foundation Berlin to welcome noble prize winner and Einstein BIH Visiting Fellow Thomas Südhof for a public interview and conversation at the Café Einstein Unter den Linden. 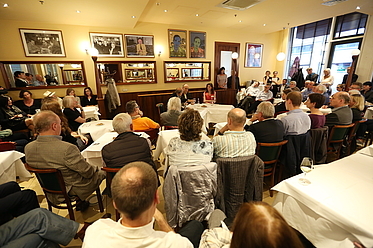 Dr. Marion Müller, Managing Director of the Einstein Foundation Berlin, and Gerald Uhlig-Romero, owner and founder of the Café Einstein Unter den Linden, lead through the conversation. 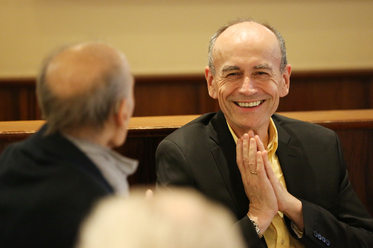 Accompanied by applause, Südhof, a German neuroscientist who lives in the USA and is doing research at Stanford University, entered the room and smilingly took his seat. Now the talk could begin. 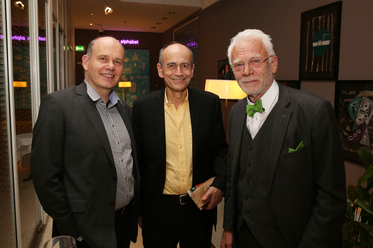 The passionate enthusiasm that drives Südhof when talking about his research projects became obvious when he explained the science for which he received the noble prize in medicine in 2013. Südhof described the experience as exciting, surprising, a great honour, but definitely not an endpoint. You have to do the same thing over and over again if you want to get a scientific challenge - just as if you were practicing scales. But it is equally important to step back once in a while and allow yourself to break free as it were and look at the topic from the outside. Science, he added, happens between people: The situation within science was different today than it had been for Albert Einstein in his days. Einstein developed many of his ideas while sitting in his office all by himself. Today communication played a large role in scientific progress. Communication is also at the heart of the cooperation between the Rosenmund Lab at the Charité Berlin, and the Südhof Lab at Stanford University. Together they are working on the malfunction of synapses. The Rosenmund Lab provides important know-how and technology to make synapses visible. When a nerve cell is stimulated in a petri dish, a high pressure freezer records the process within milliseconds. This moment is accompanied by a loud bang. Südhof enthusiastically commented how exciting and rewarding it was to catch vesicles in the act. When asked about differences between the science systems of the USA and Germany, Südhof emphasized the American openness in discussion and exchange. During his career he had benefitted greatly from meeting people who brought different qualities and talents to the table. This interaction with people had definitely furthered and supported his scientific career. Labors and groups in Germany tended to work slightly more self-contained, which could be seen as a disadvantage when it comes to cooperation with other institutions. On the other hand, Germany had always understood to treat problems in the long term including financial aspects, which to Südhof's eyes is very positive. The conclusion of his observations put in a nutshell: Both systems have their own benefits and disadvantages. In the spirit of your project you have to make the best out of them. 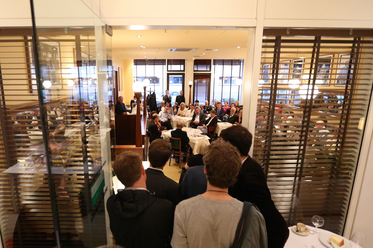 “It was not only informative and entertaining to talk to Prof Südhof, but very inspiring at the same time. The serene pleasure, enthusiasm and excitement with which he talks about his work is as fabulous as it is impressive. The answers which he kindly provided for our section “Einstein Questionnaire“ clearly emphasize this fact. 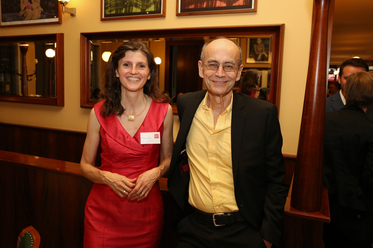 It is a great honour for the Einstein Foundation Berlin to fund such an outstanding scientist. 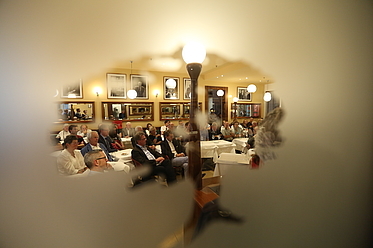 We hope to be able to host Südhof again some time and continue to learn even more about the cell's ability to communicate“, Marion Müller summed up the event afterwards.